A 1031 Exchange, also known as a like kind exchange or 1031 tax deferred exchange, is a great way for investors to defer the payment of Federal and State capital gains taxes by buying a new property with the sale proceeds of their old property. We’ll cover in this complete guide on section 1031 property exchange the latest 1031 rules and whether they will be affected by tax reform, the 1031 exchange process as well as 1031 rules that investors must comply with. Why Can’t You Do a 1031 Exchange on a Primary Residence? What Is Your Primary Residence If You Have Multiple Homes? What Are like Kind Exchange Rules? How Much Replacement Property Must You Purchase for a 1031 Exchange? What Happens When Your Replacement Property Costs More Than Your Relinquished Property? Do Owner Occupied Multi-Family Properties Qualify for 1031 Tax Deferred Transfers? Is There a Minimum Holding Period for a 1031 Exchange? The 1031 tax exchange is a special tax saving transaction permitted under the Internal Revenue Code (“IRC”). The 1031 like kind exchange originally started as a way for farmers and ranchers to trade livestock with each other without incurring capital gains tax. It has since evolved to be primarily used for deferring capital gains tax when buying and selling investment real estate. It is important to understand that when it comes to real estate, 1031 transactions are only allowable for investment, trade or business use real estate. That means you cannot do a 1031 swap for a primary residence, which is already covered by IRC Section 121 which provides a generous exemption on capital gains tax. However, Google is allowed to do a 1031 Exchange on their headquarters building in Manhattan’s Meatpacking District because it is considered business use real estate. 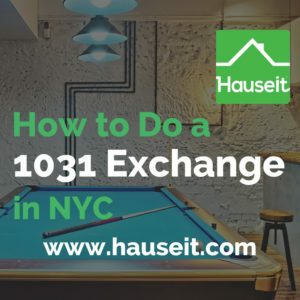 The vast majority of 1031 exchanges will be forward 1031 exchanges, which means you sell first and then buy. The typical additional cost for a forward 1031 exchange will be approximately $1,000 to $1,500 additional in fees. Most real estate professionals will never encounter a reverse 1031 in their careers where the taxpayer buys first and then sells. According to a Hauseit survey of industry professionals, 98% of 1031 tax deferred exchanges are standard forward 1031 transactions. That’s because not only do reverse 1031 transactions cost significantly more with additional fees of $10,000 or more, taxpayers will also incur an additional transfer tax with a reverse 1031. Dec 2017 Legislative Update: There should be no impact on residential real estate 1031 tax deferred exchanges in the upcoming tax reform, subject to finalization and passage which is expected by early 2018. Locally, the NYS Department of Financial services has mandated on December 18th, 2017 that tipping or paying closing coordinators from the title company is now illegal. It was previously customary for buyers to tip the closing coordinator $200 to $300 at closing. Furthermore, title companies cannot waive preliminary title search or coop lien search fees for lawyers who refer them a lot of business unless they will waive those fees for everyone as a policy. New Anti-Smoking Law: All multi-family dwellings with 4 or more units will need a written policy by summer 2018 on where smoking is allowed or not allowed in the building. As a result, some buildings will likely restrict smoking altogether in the building, even inside an individual owner’s apartment! The law will apply to vaping as well as traditional cigarette smoking. There will be some exceptions for existing owners. Violations of these new building smoking policies will likely result in fines for condo owners and possibly even eviction for co-op apartment owners. Co-op boards could say that the shareholder tenant is violating the terms of their proprietary lease. Pro Tip: You can contact your mortgage broker or bank to do a cash out re-financing immediately after you close on your replacement property in a 1031 exchange. This is an especially interesting way to use money you’ve earned from capital appreciation without incurring any income tax. For example, if you purchased a property for $200,000 all cash 10 years ago which is now worth $1 million, you can do a 1031 exchange for a new $1 million property without incurring any capital gains tax. Furthermore, you can do a cash out refinancing at close and take out a mortgage of $800,000 without incurring any tax liability. You are then free to invest or spend this $800,000 at will! Primary residences already receive a hefty exemption from capital gains tax of $250,000 of gains per individual or $500,000 of gains per married couple. Per IRC Section 121, taxpayers can take advantage of this tax exemption every 2 years, as long as the property has been their primary residence for any 2 out of the past 5 years. Please note that as of this writing in December 2017, Congress is deliberating whether to amend the residency requirement. The amended residency requirement could change to 5 out of the past 8 years which could make it significantly harder for home owners to take advantage of this exemption. There are a few exceptions to IRC Section 121 if you haven’t made a home your primary residence for the required length of time before you need to sell. The most common is a qualified work relocation if your employer is mandating that you move to a different part of the country because your job has been transferred. Please note that this exception is really meant for instances where the taxpayer has no choice but to move and will not have a job with the employer if he refuses. You cannot take advantage of this exception because you voluntarily have decided to quit your job and want to move to a different part of the country! Pro Tip: Confused about closing costs in NYC? Estimate your buyer closing costs in NYC using Hauseit’s interactive closing cost calculator. There are many simple ways to verify your primary address in any given tax year. The simplest way is for the IRS to check the address you provided on your annual tax return. In addition, the IRS can simply check the address given on your driver’s license or check for the address you’ve given when you registered to vote. There is a whole cottage industry around what’s called residency and tax planning that caters to wealthy individuals looking to minimize their local and state tax burdens. These residency and tax planning experts also guide taxpayers on how best to take advantage of IRC Section 121 if they need to sell. Note: NYC residency audits are known to be extremely diligent. High income residents of NYC seeking to avoid paying NYC income tax will have a hard time doing so as NYC residency audits are known to even check the GPS location data of taxpayers’ cellphones! Pro Tip: Curious to know how real estate investors in NYC calculate the returns on their rental properties? 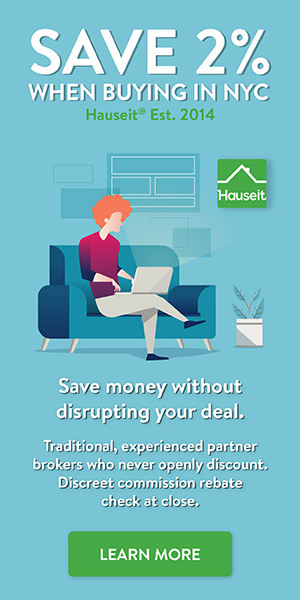 Calculate investment returns using Hauseit’s interactive investment returns calculator for rental properties in NYC. The client then must sell this property and coordinate the closing with a “qualified intermediary” who serves as an escrowee for the sale proceeds. Note that in a 1031 exchange, the taxpayer never touches the sale proceeds from his or her sale. The taxpayer must then purchase a new property, called the “replacement property,” with the funds held in escrow by the qualified intermediary. The taxpayer may supplement the escrow funds with additional money of his or her own or with bank financing. However, it will be necessary to use up all of the escrow monies in order to completely defer capital gains tax. Anyone who has not been an agent for the taxpayer within the past two years can be a Qualified Intermediary. This means lawyers, accountants and real estate brokers who have worked for the taxpayer at any time within the past 2 years are disqualified from being a Qualified Intermediary. However, because there are no license or insurance requirements for being a Qualified Intermediary, just about anyone can technically be a Qualified Intermediary. In reality however, most Qualified Intermediary companies are either affiliates or subsidiaries of title companies, or standalone companies that specialize in being Qualified Intermediaries. You will need a competent Qualified Intermediary who will accurately process all of your paperwork in a timely manner and who can safely handle your money. Furthermore, you will need your Qualified Intermediary to accomplish all of this while also refraining from providing you with any advice in order to not disqualify themselves from being a Qualified Intermediary in the first place. Fees with Qualified Intermediaries can certainly be negotiated. For example, you should confirm who will keep the interest from your escrow monies. Furthermore, you should confirm whether you will be charged only one flat fee, or whether there are more fees for different scenarios (i.e. being charged more if you buy multiple replacement properties). What are your safeguards for protecting escrow money? Do you have fidelity bonds in place to protect against employee theft of escrow monies? How do you keep track of 1031 exchange deadlines? Do you move money via certified checks or via wire transfers? As we’ve previously discussed, a 1031 exchange is meant for investment properties versus personal residences. Primary residences are already covered by significant capital gains exemptions under IRC Section 121. There are no tax shelters available for second homes, though conceivably if you could do a 1031 on a second home if it legitimately becomes an investment property. In 2002, the IRS clarified that cooperative apartments were eligible for exchange property sales because of the lengthy proprietary leases that co-op shareholders have on their apartments. The reasoning was that if you have a 30 year or longer lease on a property, the IRS will treat it as if you owned the property. This also means that commercial tenants with say a 10 year lease but two options to renew for an additional 10 years each time will qualify for a 1031 exchange. All commercial, residential, industrial and even undeveloped land is eligible for a 1031 exchange. In the case of undeveloped land being the replacement property, you may face issues with getting a full capital gains tax deferral because undeveloped land will typically be worth less than the developed relinquished property. However, for developers who intend to build on the undeveloped land they purchased, they can do a more complicated “built to suit” 1031 exchange which will let them attribute the finished value to the replacement property. Certain states will have restrictions on state capital gains tax deferrals for cross border 1031 exchanges. For example, Georgia will only allow you to defer their state tax in a 1031 transaction if the proceeds are re-invested in Georgia. In contrast, New York State does not care where the proceeds from a 1031 transaction are re-invested. A Section 1031 tax exchange can otherwise be done between any property type located in the United States and any of its overseas territories. That means you can do a 1031 exchange between a property in New York City and a property in Guam, Puerto Rico or the U.S. Virgin Islands. Foreign property is not considered like-kind and is therefore not eligible for a 1031 exchange. That means you can’t sell your New York City co-op apartment and buy a condo in Singapore through a section 1031 tax exchange. An equivalent to the 1031 exchange for foreign property is possible between certain European countries. This is a very specialized area with only a few experts in the field. Please contact us for more information and referrals. Generally speaking, the same taxpayer must be both the seller of the relinquished property and the buyer of the replacement property in a 1031 exchange. However, there are two very important exceptions to be aware of. It is alright for married couples to add or subtract their spouse from a 1031 exchange transaction. This is because the IRS views the married couple as one tax filer. Similarly, it is okay for an individual to switch between using her personal name to a single member LLC in which she is the sole member for a 1031 exchange. The IRS views single member LLCs as a “disregarded entity” for tax purposes. In theory, this should mean that you can add your spouse to your single member LLC, especially if you are already filing taxes jointly. In order to fully defer your capital gains tax, your replacement property must be equal or greater in value to the sale price of your relinquished property. While the above is an easy and general rule to remember, it’s interesting to know that you can deduct your seller closing costs from your sale price when calculating how much replacement property you must buy. For example, if your relinquished property sold for $1 million with closing costs of $50,000, then you need only buy $950,000 worth of replacement property! It’s important to study what NYC closing costs are for yourself because many real estate brokers will be hesitant to make you aware of just how expensive transaction costs can be in New York City. Most real estate brokers will simply tell you that the prices must be the same, either because they truly don’t know or because they are maliciously refusing to disclose the scope and impact of closing costs. Taxpayers have a limited amount of time to complete a 1031 exchange. The clock begins on the closing date of the relinquished property. From that date, taxpayers have 45 calendar days to identify one or more replacement properties and 180 calendar days total to close on the replacement property. It is important to emphasize that we are talking about calendar days versus business days. As a result, it’s always good to not wait until the last minute because many firms won’t be open on a Saturday or Sunday if that’s when you desperately need to close on your replacement property. You must inform your Qualified Intermediary of the replacement property or properties you wish to buy within 45 calendar days of the closing of your relinquished property. While you can technically inform your Qualified Intermediary of your choices in any manner you wish, a good Qualified Intermediary will insist that you use their form. That’s because their form will typically be more formal and include the exact time and date on which you’ve made the decision. This way, there will be none of the confusion that could result if for example you mailed in a slip of paper with your decision but without a time stamp! If the 45 day deadline falls on a weekend, it’s best to send in your replacement property choices at least a few days in advance so that your Qualified Intermediary can process it in time. Remember that the applicable time zone for all of these deadlines is your local time zone. Thus it does not matter if you are based in New York but use a California based Qualified Intermediary in the hopes of getting 3 extra hours. You can change your mind on your replacement property at any time prior to the 45 day deadline. Note: Selling or buying a coop in NYC as part of a 1031 real estate transaction can be especially tricky because you’ll have to wait sometimes months for co op board approval. Furthermore, if you get a board turn-down or rejection then you may lose your window of opportunity altogether due to the delay. In terms of timing to close on your replacement property, 1031 requirements actually state that you must close within the sooner of 180 days or when you file your next tax return. However, you can get around the latter requirement by filing an extension on your tax returns so that you can get the full 180 day time limit. This is an important consideration to keep in mind as it can easily be overlooked by someone who’s unfamiliar with 1031 real estate transactions. Pro Tip: All of the proceeds in escrow from the sale of your relinquished property must be used up in a 1031 exchange to fully defer capital gains taxes. Therefore, make sure your lawyer adds a clause to your purchase contract that gives you the right to trade out of your contract deposit with money from the escrow account. This will be relevant if you sign a contract and deliver a contract deposit on a replacement property before you’ve closed on your relinquished property. The replacement properties you identify do not need to be actively listed for sale by a real estate agent. It can be a For Sale By Owner property or even an off market property if you are buying your neighbor’s apartment for example. However, you do need to specifically identify the properties you wish to buy. That means providing a specific address like 214 East 30th Street Apartment 5A versus just 214 East 30th Street. Choose up to 3 replacement properties regardless of their fair market value. Choose an unlimited number of replacement properties as long as the fair market value of all of them at the end of the identification period does not exceed 200% of the fair market value of the relinquished property. Choose an unlimited number of replacement properties as long as the taxpayer closes on at least 95% of the total fair market value of all of the identified replacement properties. As you can imagine, option 1 will be the most common and straightforward choice for most taxpayers. Option 3 may be applicable if the relinquished property is a high value, trophy asset such as the World Trade Center in New York. If someone wanted to sell the World Trade Center and buy a portfolio of inexpensive single family homes in the Midwest, option 3 may be a reasonable option to consider. Pro Tip: You can reduce the risk of missing a 1031 exchange deadline by getting a contract signed on your replacement property in advance of closing on your relinquished property. For example, if you sign a contract to buy a pre-construction project which will take another year before construction is finished, you can give yourself more time to successfully sell your relinquished property. You are completely free to buy a replacement property that costs more or less than your relinquished property. If your replacement property costs more than your relinquished property, the extra cost is simply added to your tax basis. For example, imagine that you sell a property with a cost basis of $800,000 for $1,000,000, then purchase a replacement property for $1,500,000. The additional $500,000 will be added to your cost basis and your new cost basis will be $1,300,000. As a result, your $200,000 of gains from the sale of your relinquished property has been carried over to your new, more expensive replacement property. If you live in one of the units of a multi-family property and rent out the other units, then you may utilize both the IRC Section 1031 and Section 121 tax savings. When it comes time to sell, you would simply get an appraisal to estimate the value of the individual units. You would be eligible to take advantage of the Section 121 tax exemption for the value of the unit that you reside in, plus you would be able to do a 1031 exchange on the value of the units that you are renting out. Another example is a 50 acre farm with a personal residence occupying just one acre of the land. You could do an appraisal to get an estimate of the value of the single acre where the home is, as well as an appraisal of the remaining 49 acres of farm land. You could then take advantage of Section 121 and exempt up to $500,000 of gains from tax as a married couple on the single acre where your home is. Additionally, you could do a 1031 exchange on the remaining 49 acres of farm land! Note: Single family houses and apartments do not qualify for both IRC Section 1031 and Section 121 even if you are renting out a single room in your personal residence. Similarly, you cannot take advantage of both Section 1031 and Section 121 if you have a home office or a street-facing parlor that is used for business purposes. This is because the fact that the property is your primary residence outweighs that fact that you use part of your home for investment or business activities. There is no penalty from the IRS for canceling a 1031 exchange sale although your Qualified Intermediary may charge you a fee for services rendered. If you never identified a replacement property within the 45 day deadline, you can simply get your money back from your Qualified Intermediary. However, a Qualified Intermediary cannot release your funds from escrow until day 45 because there’s a chance you could still identify a replacement property. If you want to cancel a 1031 tax deferred exchange after day 45 but you have identified a replacement property in time, the Qualified Intermediary can only return your money after the full 180 days have passed because there is always the chance that you could still close on the replacement property. Pro Tip: You may receive the unintended benefit of a lower capital gains tax rate if you cancel a 1031 exchange in one year but receive the funds from escrow the following year. This can happen if there is tax reform and Congress reduces tax rates. You are taxed at the current rate of year in which you receive your money back! Additionally, you will only have to pay the capital gains tax on April 15th of the year following the year that you get your money back, allowing you to invest the proceeds in the interim! There is no minimum required holding period for a replacement property that was purchased through a 1031 tax deferred exchange. With that said, immediate flips are not encouraged as you are supposed to go into a 1031 exchange with an investment intention. If you know going into your closing that you will be able to immediately flip your replacement property, then a 1031 is not allowed as you did not have a “mental intention” to use the replacement property as an investment property. Even though this can be a grey zone, it is better to play it safe when it comes to the IRS and hold on to your property for at least 2 years before selling to qualify for Safe Harbor. If you do that and qualify for Safe Harbor, you are protected from any penalties even if you did intend to flip it because you had mechanically followed conservative standards that qualified you for Safe Harbor.